Music is 17-year-old Charlotte Goode's life. Unfortunately, she's also coping with neurofibromatosis type II, where tumors grow along the nervous system. When the doctors discover tumors in her brain, they schedule an operation to remove them, but at the cost of Charlotte's hearing. With a month to go until the operation, she has a lifetime of music and sound to squeeze in, including judging a pair of bands for a local magazine. The stark yet emotional narrative flips between pre- and post-operation as Charlotte struggles with the life-altering event, along with family drama and the stirrings of a new relationship with a charming musician, Matthew. 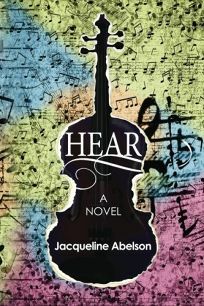 Abelson presents the story with complexity and delicacy, focusing more on the emotional aspect of Charlotte's situation than on the medical details; the significance and consequences of Charlotte's decisions are rendered in an almost poetic manner. While some moments and family interactions feel overwrought—Charlotte's brother-in-law is almost criminally oblivious to her feelings—Abelson offers a powerful, honest story. Ages 12–18.